2. What social media tools are you currently utilizing? Which has helped your organization the most and how? We have 325 social media sites that we post to regularly, but in addition to all of the ones that everyone knows about, two of the most effective are Posterous and TrafficGeyser because we can post once to these accounts and they syndicate out to hundreds of article, podcast, blog, video and photo sites at once. We have two full-time, paid people working on social networking along with me. Chris Poole is our full time Videographer and Media Producer. In addition to filming everything, he then creates the finished products, with a goal of one completed video per week, and then posts it to all of our social video sites. Chris then spends about 8 hours per week responding to comments an building relationships with our viewers. We have a second paid person, LaWanna Mitchell, who creates e-cards, games, screensavers, puzzles and a plethora of free downloads for our website. 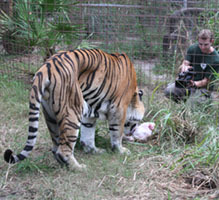 She also helps cultivate community on a number of our social sites including ours at ChatBigCats.com. The ROI for us is measured in lives saved more than just the money raised to do so. Most of the perils that big cats face are the result of exploiters banking on the fact that people are mesmerized by tigers and want to touch them. The Pay to Play schemes are what cause so much breeding, abuse and then abandonment, but the people paying for these photo ops and play sessions don’t know what they are supporting. Our videos enable us to educate the public while entertaining them. 5. Have you been able to use these tools to raise money online? As CEO, the buck stops here, (but sometimes, in years past, not enough of them) so I am always looking for ways to promote our message and create more efficiency in the way we raise money and achieve our goals. Like every thing else, the more you give the more you get. Chris works very hard to capture the essence of the cats and then craft that into a video that is inspiring and has elements of humor to make it go viral. He also puts a lot of thought into his responses to all of the YouTube and Facebook comments because he is on the front lines of changing the way people think about wild cats. Because of that added effort we are the 6th most viewed (all time) and 7th most subscribed (all time) nonprofit on YouTube. As we speak our second iTunes app is in the making. These were both donated, but we are investing in a text-to-give campaign with Mobile Commons that isn’t quite breaking even yet, but I think it has potential. We are also investing in a complete overhaul of our 17,000 file website at BigCatRescue.org that has taken 9 months and thousands of dollars, but will result in integrating social aspects that should improve our reach and influence. The site currently has 1.6 million new visitors per year, but we anticipate that going much higher as people are able to comment and easily rate and post pages to their social networking sites. Technology and “what’s hot” is changing all the time, so the successful social media practitioner will always be researching the best tools and the best places to be seen and heard. Once there, it is important to let our fans know that they matter and that they are being seen and heard. Chris also notes the headlines and tags of videos that are trending and often patterns our next video to capitalize on the buzz. We also provide reliable content in our article posts, which are often picked up by the media which brings even more awareness. Because all of our social marketing has increased our web traffic by more than 25% our keywords are usually on the first page of Google. That has lead to 688 stories in the press including CNN, ABC, NBC, Fox, Anderson Cooper 360, Animal Planet, Dateline, Discovery Channel, Glamour Magazine, History Channel, Jack Hannah Show, Newsweek, National Geographic, New York Times, Oprah Magazine, People Magazine, Sports Illustrated, Today Show, US News & World Report, Washington Post & more. Our plan for 2011 is to keep growing the relationships we have been building in all of these social arenas and to roll out our new website. Many of the disparate segments of our online business, such as our blog, online gift shop, stock photo business, weekly podcasts, advocacy site and our own social site will all be brought under one roof in the new member site. Because our supporters just can’t get enough of the big cat photos and videos we have just launched a new YouTube site for mini clips that we capture throughout the day of the cats and volunteers in action. We did not want to dilute the quality experience of our main YouTube site, so this one is called youtube.com/DailyBigCat. I listen to dozens of podcasts whenever I am driving or exercising about online marketing, SEO, and anything I can find on emerging technology, entertainment and design, with my favorite being TED. We will continue to jump on every new band wagon that makes the news, but will only keep the ones that prove successful. Thank you for this interview. I’ve learned great tips. Keep up the good work. Great interview! I love seeing what other social media managers are doing and using to communicate their message. I look forward to more interviews.